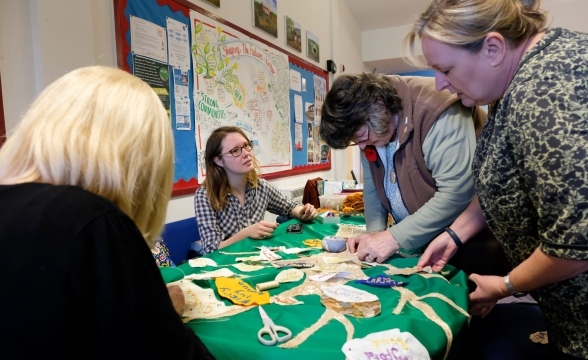 It’s a case of ‘so far, sew good’ for a community scheme in Northwood, Kirkby, that is using creative arts and crafts to help encourage recycling. The Northwood CommuniTree 4aRts project is working across the Northwood area in a bid to engage local residents and get them to think about reducing waste and boosting re-use and recycling. The project is being delivered by Faiths4Change – a registered charity which uses arts, health and wellbeing activities to engage with communities on environmental matters – in partnership with Northwood Together and Knowsley Council. Faiths4Change has received over £7000 of funding for the project, which comes from the Merseyside Recycling & Waste Authority and Veolia Community Fund 2018/19. The Fund was set up to help support waste prevention, re-use and recycling projects locally. Northwood in Kirkby has traditionally low levels of recycling. By working with the Community Fund and Knowsley Council, Faiths4Change hope to create clear and consistent behavioural change messages through arts and crafts activities to help the local community turn these statistics around. The project will conclude with the Northwood ‘CommuniTree’ Resources exhibition featuring items created by local people at the workshops, a 3D CommuniTree sculpture made of recycled plastic bottles and a canopy made from recycled materials such as textiles. Liz Atherton, Arts & Wellbeing Project Co-ordinator at Faiths4Change, said: “By bringing together old and young, groups, schools, and organisations from across Northwood we can all create a really positive environmental noise about, with and for the area. There is a wonderful community spirit here and you see it every day at the Community Centre. Twelve volunteering opportunities have also been created in partnership with Northwood Together. Faiths4Change are hoping that local volunteers, with the right support, will encourage engagement amongst family, peers and neighbours. MRWA_F4C 1 Marlene Robinson, Lisa Cover, Liz Atherton and Julia Adlington stitch the Northwood CommuniTree. MRWA_F4C 2 Julia Adlington, Liz Atherton, Marlene Robinson and Lisa Cover stitch the Northwood CommuniTree. The MRWA and Veolia Community Fund 2018/19 has seen 14 community groups from Merseyside and Halton receive a funding boost to help make the region a cleaner and greener place. The financial support will see the groups help reduce household waste, encourage recycling and resource re-use, and prevent carbon emissions.